Winner of the Ernie Pyle Memorial Award. Bish speaks, as he writes, of his faith in the younger generation, the Civil War, steam locomotives, his basement workshop, his books, his many interesting friends, his family…but mostly about people…with an engaging and rewarding philosophy generously laced with humor, and a deep understanding of the foibles of mankind. He was born in Chattanooga, Tennessee on August 8, 1913, the son of a Methodist minister, thus the nickname “Bish,” a contraction of bishop. In 1935 he was graduated from Baker University in Kansas, a night editor in Vincennes, a city editor in Lawrenceville, in 1934 he became associated with the Evansville Press. Ten years later, he began his feature column, which was to bring him national acclaim. In addition, Bish conducted a daily radio broadcast in Evansville since 1947, dealing with his stirring and unusual observations on life. He was also narrator to the Evansville area, of a weekly television program, which enjoys a large and loyal audience from the three states in the lower Ohio Valley into which it spreads. He was founder and a past commander of the Civil War Round Table of Vanderburgh Court House, he was appointed by the governor of Indiana to the state’s Civil War Centennial, and the Lincoln and Indiana Sesquicentennial Commissions. Being a historian, he was appointed to the U.S. Civil War Centennial Advisory Commission by both Presidents Eisenhower and Kennedy. With all his perspicacity and talents he became one of the nation’s most prominent and refreshing lecturers, finding time to address more than one hundred audiences yearly at conventions, banquets, universities, commencement exercises, and such, always with wholesome philosophy, and decent down-to-earth good humor. As a businessman he was a board member of Franklin National Life Insurance Company, Charter Underwriters and Management, Inc., and on the advisory board of Southern Securities Corporation. He has been a steward of the Trinity Methodist Church, president of the Methodist Men, is a Mason and a Shriner, and a life member of Delta Tau Delta fraternity. He was married to the former Margaret Terhune, of Kansas City. They had one daughter, Mrs. Thomas E. (Ann) Lynch, of Las Vegas, Nevada, a son Gordon Terhune Thompson. 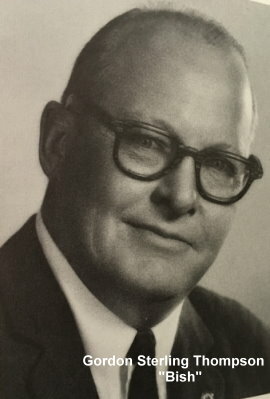 Bish Thompson died in 1980.